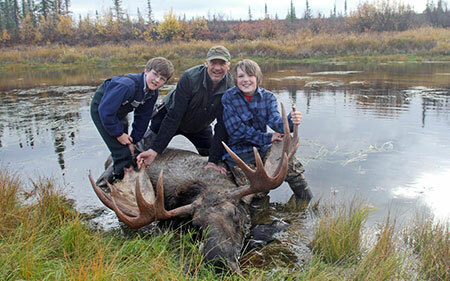 Mark Kufel and sons on a successful moose hunt. Ken Marsh photo. Moose hunting opportunities look good this year for most of Alaska, and state wildlife biologists offer some insights from the areas they manage. The bull:cow ratios have improved on the Kenai and should begin to provide modest increases in harvest. The Board of Game will consider several proposals to modify moose hunting regulations next March including proposals to return nonresident opportunity. The Funny River Road fire, at nearly 200,000 acres, was the largest since 1947. This fire should increase moose calf production and survival in coming years, and that’s good news for hunters. Biologists are making plans to evaluate the effects of the fire and monitor the response of the GMU 15B moose population. Unit 14C and Unit 6 (Lower Copper River) continue to provide good hunting opportunity. Unit 13 River basins (Copper, Upper Susitna and Nelchina rivers) continue to provide good moose harvests throughout this large and popular unit. The population in Unit 16 (Lower Susitna River and Western Cook Inlet) continues to improve and seasons have been liberalized again for both residents and nonresidents. With a good hunting season, we expect to see the highest harvests in many years. The northern part of the unit will provide some hunting opportunity, but it has not responded like the middle and southern areas. Unit 14A in the Mat-Su Valley continues to provide for moose hunters. The moose population continues to do well despite the hard winter of 2012 and still exceeds the population objectives. Year after year, this little unit provides moose harvest levels comparable to much larger Units like 20A and 13. This performance is attributable to high summer calf survival. Moose in western Alaska continue to thrive and expand their range, particularly in the lower portions of the Yukon River drainage in Unit 18 where there is low hunting pressure despite liberal seasons and bag limits. Nonresident opportunity also exists in the Togiak drainage and residents enjoy liberalized seasons and bag limits. Moose have been colonizing the lower Kuskokwim drainage and the population now supports a very popular resident registration permit hunt with a tightly managed quota. Since habitat is under-utilized in this area, future growth and higher quotas are expected. North Slope moose were hit hard by weather in the last two years and populations have dramatically declined resulting in emergency closures of seasons. The declines were likely exacerbated by higher numbers of predators. This phenomenon is not new for the area. In the past, the population was able to recover in a reasonable amount of time. 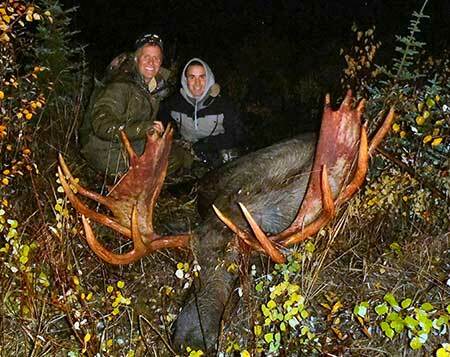 Caleb Mikkelsen hauls out a nice moose rack. Antlers are the last thing to come out of the field. Interior moose hunting opportunity remains outstanding. Unit 20A south of Fairbanks is a perennially strong producer but it will see reduced opportunity for cow moose as population performance has sagged a bit. Unit 20B will continue to see high harvests as moose numbers in this large unit have increased substantially in recent years. Biologists would like to slow growth of the population to keep it in a productive state that can provide high levels of harvest. In Unit 20D, hunters can expect harvest levels similar to the past several years. 20D bull harvest has been stable since 2000. Harvest success for the past three years has averaged 27. Moose populations across the Galena Management Area are generally stable, however localized declines in the Koyukuk Controlled Use Area and reduced bull:cow ratios required a reduction in Drawing Permits offered for the 2014 season. Good calf production and survival during 2005-2007 and burns that occurred in 2004-05 benefitted moose in portions of 21D, however poor winter calf survival from 2011-2013 and a maturing age structure appear to have offset those previous gains. At this early stage of the Intensive Management program in Unit 24B, changes in moose densities or calf survival have not been detected. Moose are found in most of the suitable habitat in Southeast Alaska. Overall, herds across the region are doing well and harvest opportunities should be similar to last year. Moose are found in low densities in southern Southeast, Unit 1A. The Unuk and Chickamin River drainages are the primary areas to hunt moose in the unit. Historically, few moose are taken in these areas and harvest opportunities should be similar in the coming year. Moving up the mainland coastline: Except in isolated pockets, moose inhabit the Unit 1B mainland in low densities. The Unit 1B moose population is believed to be stable at moderate density, with the highest concentrations occurring within the Stikine River Drainage, and at Thomas and Farragut bays. In fall 2014 hunters can expect the Unit 1B moose harvest and success rates similar to last year. Moose on the Unit 3 islands (especially Mitkof and Kupreanof) emigrated in the past several decades from the Stikine and possibly Thomas Bay populations on the Unit 1B mainland. The Unit 3 moose population continues to expand in both distribution and abundance, with moose now occupying all the major islands within the unit. Since the entire unit opened to moose hunting in 1993, the unit has experienced a steadily increasing harvest trend, with Kupreanof Island producing the majority of the unit wide harvest annually. In fall 2014 Unit 3 moose hunters can expect moose harvest and success rates similar to last year. In Unit 1C, the Department was able to offer a modest number of permits for Berners Bay for the first time in six years, and the Gustavus bull to cow and calf to cow ratios continue to improve. Harvest data for the remaining portion of the unit does not suggest there have been any significant changes, and harvest opportunities for the coming year should be similar to 2013. Moose are distributed throughout Unit 1D in Upper Lynn Canal. The Chilkat River drainage is the most popular hunt area in the unit. Based on aerial survey data moose numbers were lower than the previous year but are similar to the long term average data for moose surveys in the area. Hunting opportunities should be similar to 2013. Unit 5 moose are distributed across the Yakutat and Malaspina forelands. Based on aerial survey data for the Yakutat Forelands moose numbers were lower than the previous year but are similar to the long term average data for moose surveys in the area. Other areas in Unit 5 see little hunting pressure and low harvests. Hunting opportunities in Unit 5 should be similar to 2013. 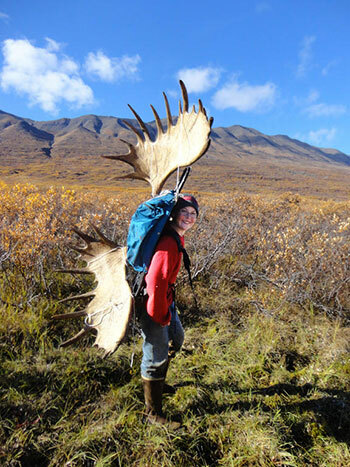 Hunters curious about harvest and success rates for various hunts and areas of Alaska can find moose harvest statistics on the Fish and Game website. General moose information on moose hunting in Alaska. Information on identifying legal moose, field care of game meat, hunting videos and more resources.